The most wonderful part about the idea of practicing daily gratitude is that any person can do it. Unlike many concepts, like faith or prayer, which tend to be examined via certain religions or spiritualities, thankfulness is pretty universal. Living Life as a Thank You illustrates extensively how incorporating gratitude into one's life can draw enormous benefits for everyone. This book serves up ten chapters full of stories about how learning to be grateful has changed people from all walks of life. Each chapter carries a theme, ranging from "the power of gratitude to make a difference in the world" to "gratitude in times of transition." Each chapter begins with an introduction, musings on the particular theme, then follows with seven or eight snippets from real people telling the specifics about how they have come to have gratitude play a strong part in their lives—some from epiphanies, some from years of training. 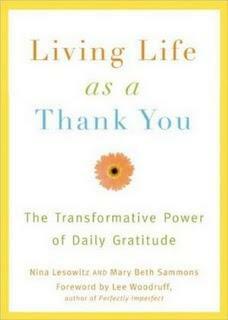 Throughout the book there are exercises, suggestions, and tips on how to bring gratefulness into your life, including a "gratitude tool kit" with proposals for ways to say thank you every day, how to make a "gratitude dream board," and how to adjust your schedule to make time for focusing on thoughts about what you are grateful for. There are also inspirational quotations peppered throughout the book, which I, as a bit of a quote-aholic, found myself writing down to give to others. I've tended, in the past, to get turned off by "inspirational" books that speak of concepts too abstractly, but one of the reasons I really appreciate this book is that it brought a broad concept down into concrete stories that I could relate to. One of the editors, Mary Beth Sammons, is a popular blogger, which was interesting to discover because the whole book reminded me of the short, focused, pondering style of blogs. Reading this book felt very much like sitting down with a bunch of people from a variety of backgrounds and having them simply speak about what they are thankful for and how they got to having gratitude so strongly in their life. For many years I have kept a personal list titled "Things That Make Me Happy"; it consists of small things that make me smile or feel uplifted. During rough times, I pull it out and read these tiny reminders of how amazing life truly is. Living Life as a Thank You argues in favor of this idea and adds how practicing gratitude every single day has the immense power to give us greater personal happiness, make us more satisfied with the present, help us celebrate triumphs, and make us generally healthier in body and mind. I found myself marveling that something so simple can do so much to change the outlook of our life, and I am grateful I was reminded of this by reading this book!